1. Cook the potatoes whole. I’ve cooked a lot of potatoes in my day and will say that this is the most flavor and texture preserving technique for potato salad. Good potatoes actually have a lot of flavor, and the dense waxy potatoes I use for salad have a firm, creamy texture. Peeling, cutting them up and cooking them in boiling water dilutes the flavor and the texture that I want to be a significant component in the salad. 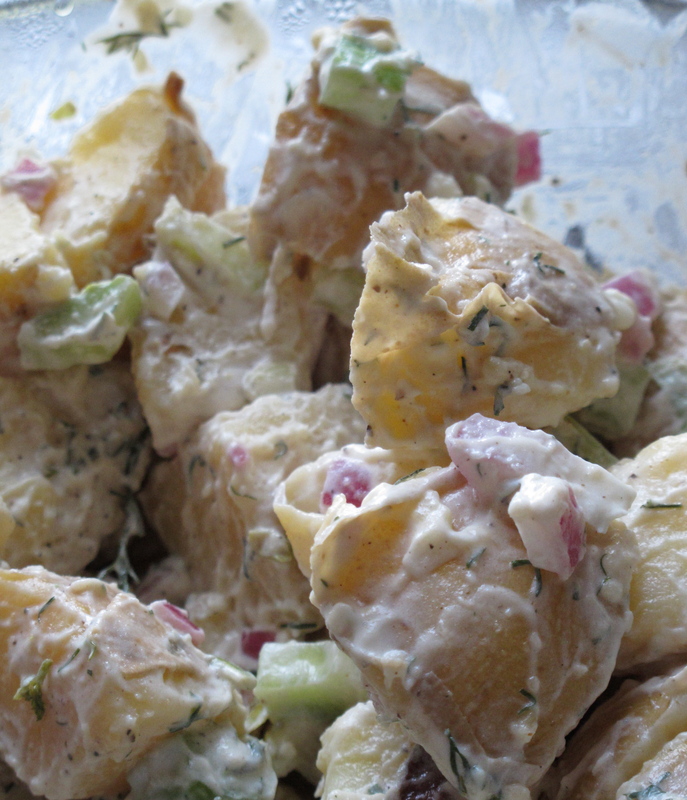 Imagine that – potatoes as a feature, rather than a vehicle for dressing in potato salad! 2. Soak the potato pieces in apple cider vinegar. To counter the creaminess of the dressing, the dense starchiness of the potatoes and the juicy crunch of vegetables, I infuse the potatoes with a flavorful acidic vinegar steam bath. It lifts and brightens the salad from a typical blandness to a subtly tangy well-balanced bite. 3. I use dashi soup powder in the dressing. This is the point at which I will tiptoe into a very hotly debated health topic: glutamate and MSG. This very interesting article in the Guardian explains the history and controversy far better and in more depth than I possibly can, but my takeaway on the topic is that glutamate is a naturally occurring flavor enhancer, found in concentrated forms in aged cheeses, kelp, fish, mushrooms and mother’s milk (yep). My preference is to use ingredients that are in their most natural usable form rather than those that are industrial by-products or manufactured compounds imitating a natural product. Sugar and salt are examples of this, rawer versions having more mineral content and flavor that more refined versions. I first heard about these dashi soup mixes from this post on No Recipes as a more natural version of the flavor enhancing properties of MSG. So, while I know this might be a controversial topic (what food isn’t these days anyway), it is something that I happily use and feed to the people who I love. Chop the bacon up and fry it. Once it is crisp and browned, remove the pieces from the fat they have rendered and set the bacon on paper to drain. Wash the whole potatoes and cover them with an inch or two of salted water in a pot. Bring them to a low boil and cook until a sharp knife slides in and out of the center of the potato easily (given that the potatoes are cooked whole, it makes sense to try to get all of the same potatoes as close to the same size as you can). Time will vary, but start checking after 15-20 minutes. Drain the water and let the potatoes cool just enough to be able to gingerly handle them. Cut the hot potatoes into bite sized pieces (I did eighths). Return them to their cooking pot and pour the apple cider vinegar over the potato pieces. Cover the pot with a lid and let the potatoes cool and soak up the vinegar. While the potatoes are cooling, make the dressing. Mix the mayo and sour cream in a big bowl. Grate the small clove of garlic on a microplane grater, or use a garlic press or heavy knife to mash it into a paste. There should be about ½ teaspoon of garlic, just a hint in the dressing. Mince the onion and celery and stir the garlic, onion, and celery into the mayo and sour cream. If you have fresh dill weed, take the bigger stems out and roughly chop the fronds; dried can go into the mix whole. Add half of the packet of smoky bonito soup mix. Taste the dressing for salt, and add some if needed, keeping in mind that the potatoes have been cooked in salted water. Stir everything together well. Once the potatoes have cooled to about room temperature, put them into a big enough bowl to stir the dressing into them with out them falling out all over the place. Pour the dressing over and grind about 10 grinds worth of black pepper over everything. 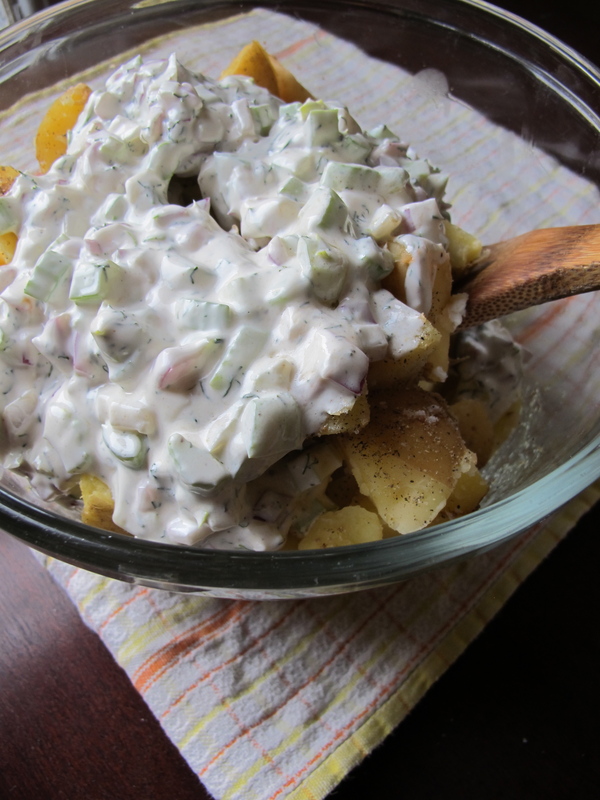 At this point the bacon can be mixed into the potato salad too, or it can be sprinkled over the top of each serving. Mixed in, it loses a little of its crispness, but incorporates its flavor throughout the salad. 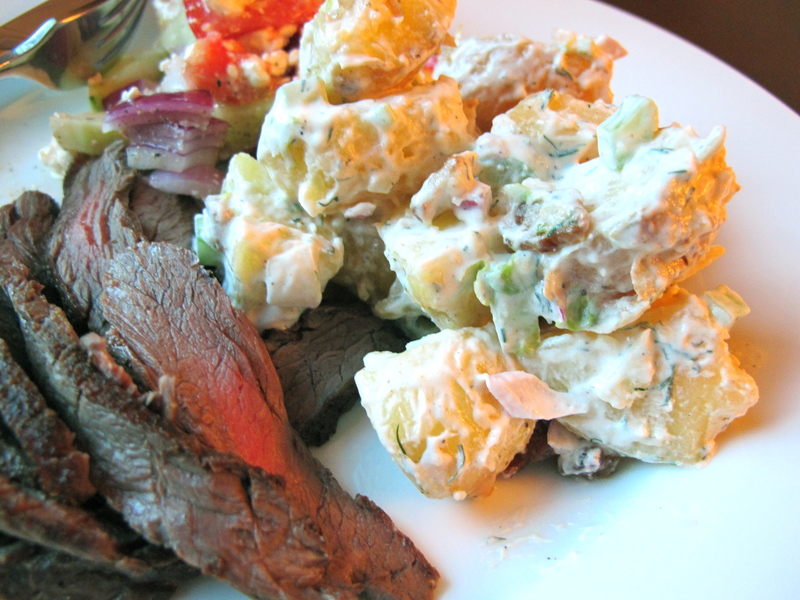 Allow the potato salad to sit, refrigerated, for 30 minutes or so before serving (it’s even better the next day). It is Allium season. All of the plants that spent the rainy winter in the ground are burgeoning in the warm weather, blooming and ripening. 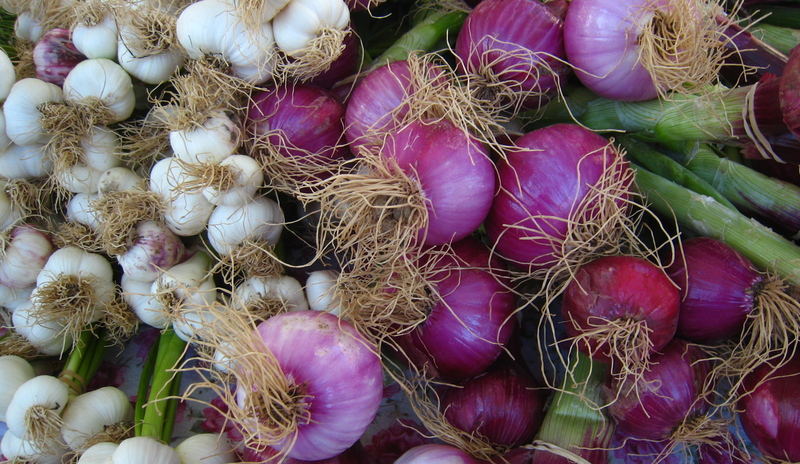 In the garden and farmers markets, broad hipped rosy red onions, mauve puffball chive blossoms, elegant jade leeks, sweet cloveless young garlic. Weyland from a couple of plots over offered me some of his leeks. He had a beautiful row of slender leeks he planted last Fall and said he didn’t really know what to do with them. I told him how to make potato leek soup, how easy and good it was so he took them home to try the recipe. A few days later, I asked him how the soup had turned out and he said it was great, they had made it 3 times. He was digging more leeks (and not offering me any) so I guilted him into giving me a nice handful. I think the reason that the Mesdames Child and Beck began Mastering the Art of French Cooking with a recipe for potato leek soup is that it is the sort of recipe that can be related while standing in a garden with a shovel in your hand. It is essentially simple without being plain, and delicious without being difficult. It always pains me to see new cooks start out with a difficult dish and then become discouraged when it doesn’t turn out well. This soup on the other hand is a great confidence builder. 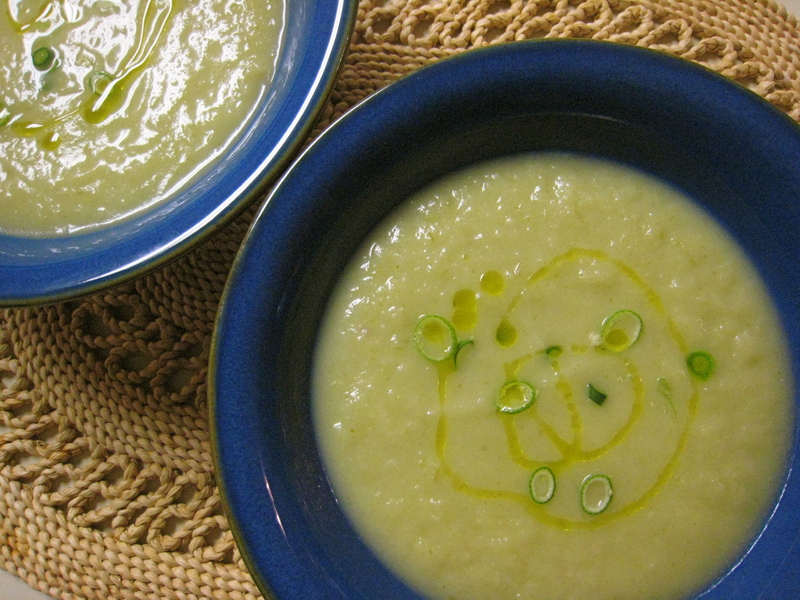 While the basic recipe requires only five ingredients- potatoes, leeks, water, salt, and cream- I sometimes augment or adapt it by adding some turnips and substituting chicken stock for water or milk for cream. The crucial step is to get all of the vegetables scrupulously clean. Leeks are notorious for hiding grit amongst its cracks and crevices. 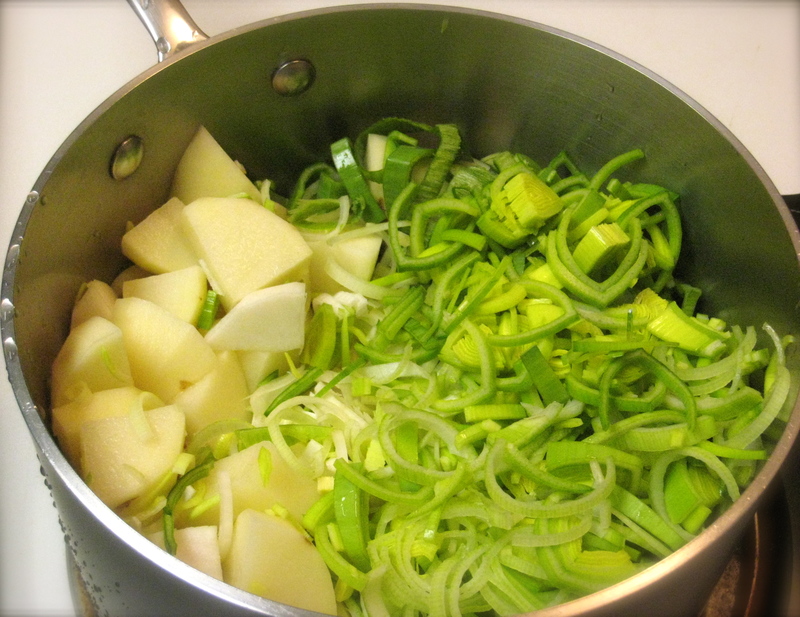 I get it all squeaky clean by first cutting off the darker green tops of the leeks, then quartering them and rinsing them in a bowl of water deep enough for the dirt to settle on the bottom while the leeks are being swished around above them. Be thorough, because “earthy” isn’t the flavor we’re going for this time. After the leeks are clean, chop them into chunks. Peel and cut the potatoes into large chunks. Dump them into a pot; add a generous amount of salt (although you will want to leave room to adjust it later) and just cover with water. Cover the pot and bring it to a low boil and cook for 20 minutes or so, until the leeks have softened and the potatoes are tender enough to crush with a fork. Using an immersion blender or canister blender, puree until quite smooth. Pour in cream, bit by bit, tasting as you go. I tend to use very little cream, just enough to enrich with out obscuring the flavor of the vegetables. Taste for salt and soup is ready. I drizzled a little olive oil and chives on top- but that embellishment is entirely optional.